My name is Claire and I'm a graphic recorder. I draw pictures and graphics to help people understand things better. I’ve worked in lots of different roles throughout my career and I’ve sat through my fair share of meetings and workshops in my time. After taking redundancy from the public sector in 2011, I now work for myself - helping people to get the most from their conversations and projects. I’m delighted to have been asked by the lovely folk at comms2point0 to give you a quick introduction to graphic recording and how it might help you in your communications. In a nutshell, graphic recording captures a discussion or conversation in a visual way. It’s suitable for any subject and any audience. For many people, seeing something drawn as a diagram or picture is far easier to understand than the same information written down in words. 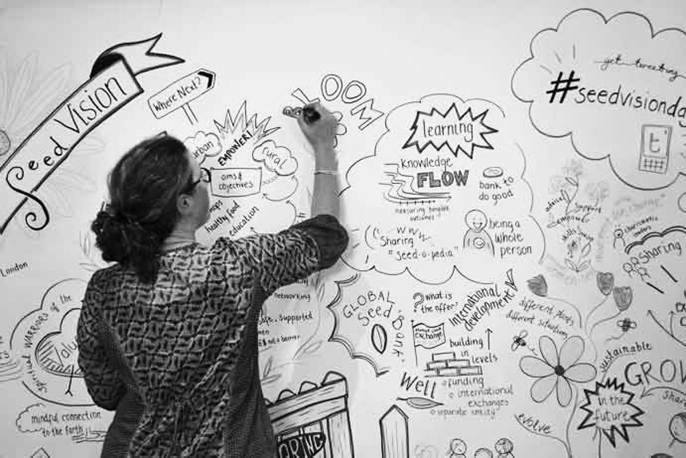 Typically, a graphic recorder will come along to a meeting, conference or workshop and produce a large drawing to help capture the essence of the day’s discussions. Also known as graphic facilitators, or visual notetakers, they may also take a more active part in facilitating the discussions, prompting the audience to join in and helping to get the ‘big picture’ across in a dynamic and engaging way. The resulting picture varies from event to event, but usually it will be a bright and bold summary of the discussions that have taken place, including images, diagrams, quotes from the day and other relevant information about the subject being talked about, all brought together in one drawing. Every graphic recorder has his or her own unique style - each of us brings our own experience and drawing style to your event and we work with you to help you get the most out of your discussions. There are lots of great benefits to gain from having your event graphically recorded. The most exciting part for me is the ability to produce something completely unique for you, the client, to keep and use. In many cases, seeing the discussions visualised allows the audience to be freed up from taking notes themselves and enables them to be more engaged in the conversation as it happens. The completed drawing is a unique piece of artwork that might be used by the host organisation to promote their project online or in printed material. It is also likely to serve as a great reminder of what was discussed for participants to take away with them - or for people who couldn’t be there in person. In fact - with today’s technology - you’ll often find that the picture can be tweeted out to the world as it develops throughout the day and exciting discussions may even be taking place beyond the physical walls of your event before you’ve even finished your presentation! One final benefit worth noting. On top of the fantastic artwork, such depth of conversation and your super-engaged audience, having a complete outsider in the room also helps to ensure your messages are likely to be understood by the widest possible audience. After all, if you can explain it to me and I can represent it in a big picture, it means more people are going to see and understand what you’re talking about. And for many organisations, that is the ultimate goal.